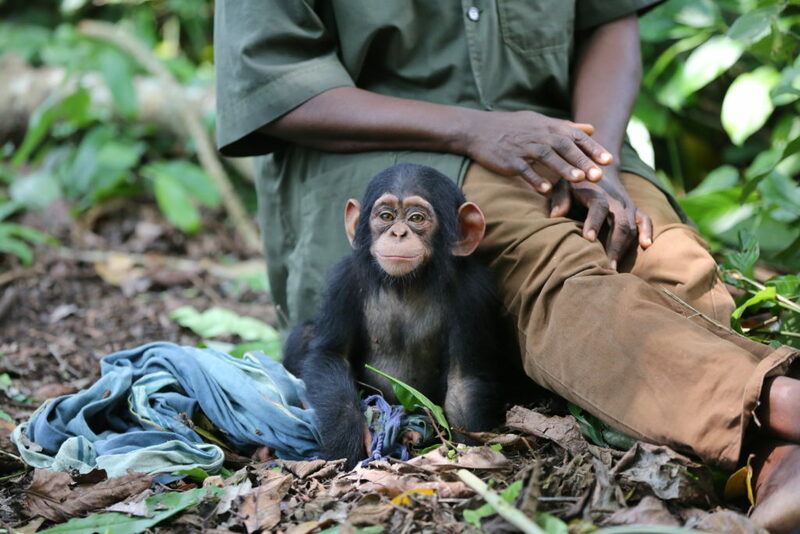 You are at:Home»Uncategorized»Announcing First Ever World Chimpanzee Day This July 14th! Announcing First Ever World Chimpanzee Day This July 14th! After years of planning and wishing, today we finally announce the creation of the FIRST EVER World Chimpanzee Day to be celebrated on this July 14th, 2018! The Jane Goodall Institute global network of chapters and Roots & Shoots Offices celebrates World Chimpanzee Day, along with many other NGOs and individuals around the globe, in honor of the day in 1960 when our founder, Dr. Jane Goodall, first stepped foot in what is now Gombe Stream National Park to study wild chimpanzees. The day will be a celebration of our closest living relatives and all we know and continue to learn about them. It is also a rallying cry to invite participants around the world to take action in efforts to conserve this magnificent species, and improve their well-being and care in and outside of captivity. Join the celebration and learn more at worldchimpanzeeday.org! Dr Jane Goodall opened our eyes to the wonder of this extraordinary species, our relationship to these beings and our responsibility to protect them. As Dr. Goodall called attention to the remarkable behaviors and lives of wild chimpanzees and continues to advocate on their behalf, we now carry the torch, taking that message and work to conserve this species even further! 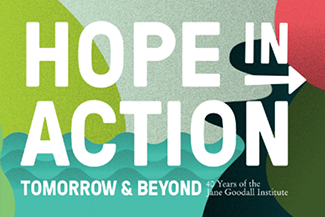 To celebrate this momentous day, we commit to invigorating the hearts and minds of global audiences, as Jane did and does, to connect to chimpanzees, learn more about them, including threats to their existence and well-being, and to take action on their behalf. We hope to share our passion and love for chimpanzees through our work to expand knowledge of wild chimpanzees with continuing research in Gombe, build holistic conservation plans and actions for chimpanzees, their habitats, and other species, while developing sustainable livelihood options for community- centered conservation initiatives, and educating and empowering a generation of compassionate, chimp-loving citizens around the world. Chimpanzees are highly intelligent and show remarkable problem-solving abilities, memory, adaptability and complex social interactions. Chimpanzees also have strong social bonds, fascinating hierarchies, and dynamic relationships. They are great communicators who use vocalizations, facial expressions, touch, and nuanced body language to convey a wide variety of emotions with others. Chimpanzees can make tools to problem solve, something that was first observed by Dr. Jane Goodall in 1960 when she saw a chimpanzee, she named David Greybeard, in Gombe National Park creating a stick out of a twig to “fish” for termites out of a dirt mound. Chimpanzees can also learn to create tools from objects in their environment and develop behaviors like nut cracking by watching others, in their species as well as from other species. Chimps have unique personalities and are sentient beings, capable of logic and building emotional connections with other species – especially humans – and are vital members of their ecosystems, as essential “seed dispersers”, helping to ensure the life of many plant and other animal species. Chimpanzees also teach us more about humankind’s primate lineage and great ape evolutionary behavioral inheritance because we share a most recent common ancestor. What we learn from chimpanzee behaviors, especially social behaviors, has potential correlations to human behaviors and thus can help identify some of our most innate responses and behaviors. Unfortunately, Chimpanzees are endangered on the IUCN’s Red List. At the turn of the 20th century, there were an estimated 1-2 million chimpanzees across 25 countries in Equatorial Africa. Current estimates suggest there are now as few as 340,000 chimpanzees remaining in only 21 African countries. They suffer due to threats like habitat loss, disease, fragmented populations, and illegal wildlife trafficking. In captivity, many sadly remain in biomedical research facilities around the world, and are kept as illegal pets, in roadside attractions and unaccredited zoos. Together we must work to stop these threats, improve their well-being in captive environments, and save chimpanzees! There are so many ways to become a part of the movement to protect chimpanzees! To start, learn more about chimpanzees by visiting our website and wiki, and share your knowledge with your friends and family on Facebook and Twitter using #WorldChimpanzeeDay! You can also sign up to become a Chimpanzee Guardian to support the care of our rescued chimpanzees, survivors of the illegal pet or bushmeat trade, and/or support our other community-centered chimpanzee conservation programs here. Pant-Hoot with us for WCD! Chimpanzees greet one another using a vocalization known as a “Pant-Hoot”, something Dr. Goodall does at every one of her lectures. 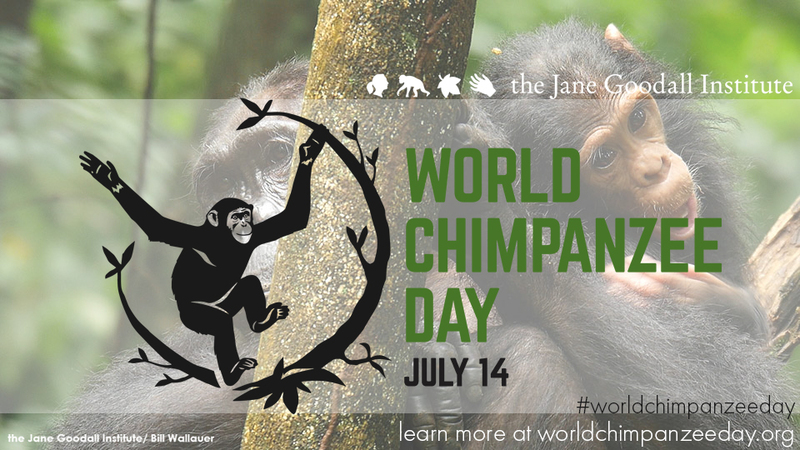 Record your best Pant-Hoot and post to social media tagging #WorldChimpanzeeDay @janegoodallinst ahead of July 14th for a chance to be featured on the day! Previous ArticleEarth Day: How You Can Make a Difference Today & Every Day!